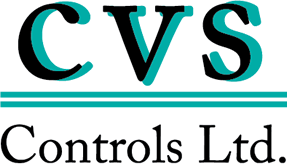 Global Supply Line are sole CVS Controls agents for Australia, New Zealand and PNG. 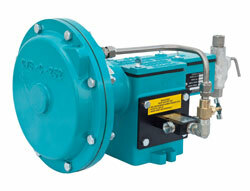 Our Adelaide valve engineering facility is capable of supporting the CVS Controls range. CVS Controls are approved by numerous companies and/or their subsidiaries worldwide including Aramco, Apache, BP UK, Chevron, Expro UK, Exxon/Mobil, JKX Oil & Gas UK, Kuwait Oil & Gas, Pertamina, Petronas, Tenex UK, Texaco and Unocal. 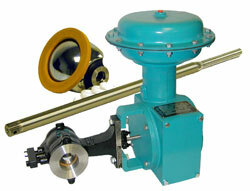 CVS Controls Ltd. is an industry leader in the manufacturing of Control Valves and associated instrumentation products. CVS are dedicated to meet and exceed the challenging needs of its diverse client base. CVS’s solid growth has come from ensuring that their products are completely interchangeable with the industry’s leading brands, and manufactured to strict quality control standards. 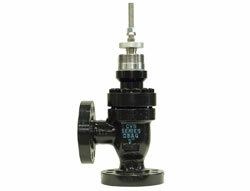 The CVS model range includes globe control valves, in line and angle style in Series D and E. The E Series includes models:- ET, ED and EZ and EWD, EWS and EWT. All of these valves are available with direct or reverse acting spring opposed diaphragm style pneumatic actuators in 657 and 667 Series in size 30, 40, 50, 60, 70 and 80. CVS also manufacture V100 Series V-ball control valve which is available with 1057 or 1061 pneumatic piston rotary actuators. 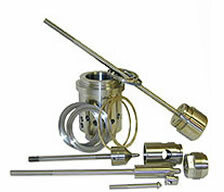 Can your supplier manufacturer special valves in as quick as 3 days? Talk to Global Supply Line and we’ll tell you more about CVS. CVS and Global Supply Line will visit your office and provide a comprehensive presentation to your engineers and plant managers. Any service challenge can be solved whether it be dirty or abrasive service, low or high temperature, cavitation or noise. Furthermore, existing valves can be retro-fitted for special service wiith anti-cavitation, abrasive service or noise abaitment trims, etc. 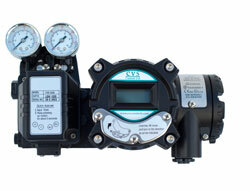 CVS Controls also manufacture wizard style pressure controllers, smart controllers and smart positioners. The popular, proven 4150 and 4160 series controllers are standard with the optional 4150LE Low Emission Series also available. 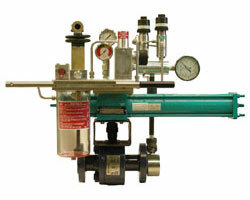 Also ask about the CVS low emissions chemical injection pump. 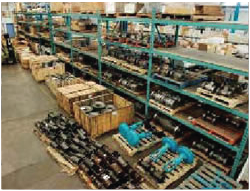 Applications serviced by CVS Controls Ltd. include Oil and Gas, Petrochemical, Mining, HVAC and Pulp & Paper. As a Fisher competitor, CVS Controls manufactures the popular ‘E’ body series. Furthermore, as a service to plant managers world wide, CVS still manufactures the D body series with micro flutes (fluted plug) in DBQ style. 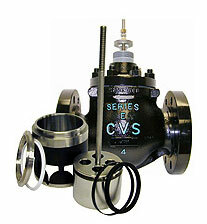 CVS can reverse engineer any control valve from your sample and manufacture it in 6 weeks! CVS Controls Ltd. is a certified and registered ISO 9001:2008 manufacturing facility with it’s head office and manufacturing facility located in Edmonton, Alberta, Canada. These valves are manufactured in Canada, you can check in online anytime and watch your order being manufactured on video in Edmonton- Alberta from raw casting through to finished valve. CVS Controls meets and exceeds their customer’s needs and expectations through the highest quality products, performance, reliability, services and safety while still maintaining competitive pricing. 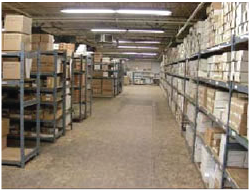 CVS is dedicated to continually improving the efficiency and the effectiveness of their quality management system. CVS’s product is manufactured under a strict quality control program which utilises the most up to date methods of testing and inspection. procedures and to ensure processes are in place to consistently review their performance in meeting these quality objectives. Spare parts and through life support are another major advantage of CVS. Price, delivery and service are superior compared to other majors and quality and longevity is guaranteed. All of CVS Controls trim and trim parts are completely compatible and interchangeable with their major competitors product. CVS Controls manufactures Control Valves and associated instrumentation products to specifications that facilitate the direct replacement with FISHER®* process control equipment. CVS replacement parts are sold around the world as non genuine parts and will suit a wide range of Fisher®* control valves. 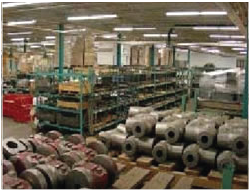 All parts are 100% manufactured in Canada to equal or exceed OEM specifications. Compatibility and quality are guaranteed by CVS. Click here for more information on CVS trim kits. *FISHER® is a registered trademark of Fisher Controls International, Inc. Fisher Controls International, Inc. and Bettis® is a registered trademark of Emerson Process Management, and both these companies are not associated or affiliated with CVS Controls Ltd or Global Supply Line in any way, nor has Fisher Controls or Emerson Process Management sponsored, approved, endorsed or otherwise reviewed any products made, sold or manufactured by CVS Controls Ltd.
CVS Controls keep $10 million of complete and semi finished valves as well as castings and parts ex stock in Edmonton. 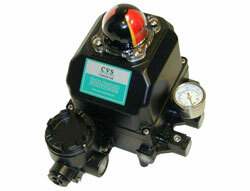 This allows Global Supply Line to provide CVS control valves in very short delivery times for urgent inquiries.